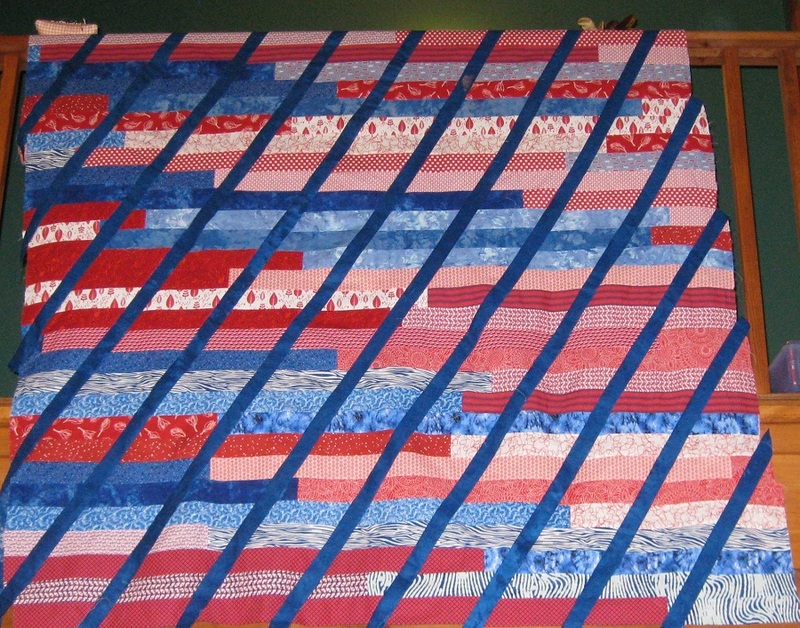 So at Guild last winter, we did 1600 quilts. I chose red, white and blue for QoV. After sewing it, I hated it. I thought it was ugly and it sat folded up in the sewing room ever since then. I finally decided that I would "slice" into it and see what I could do. I took my long ruler and just cut at 30 degrees. I next cut sashing and added that back in. I can not decide if I should cut it again in the other direction? That would add some nice dimension .... but it was trickier lining these up as it was and (OK - I think I am lazy - lol) I am thinking it looks much better as is. I like what you did! If it were me, I think I'd make vertical cuts in it (which won't be hard to line up afterwards) at uneven distances and insert some white strips which are a bit wider than the blue ones. It might even look nice to have the white sashing strips done in a variety of widths. Overall the top is kind of dark, and I think some white would really make it pop, and improve it even more. It looks good this way but I think the added demension of cutting it again would be good. I just do not know how hard that would be. If the second set of cuts do not line up well and create square boxes you may not be happy with it. rufree4t - That was the reason that I chose 30 degrees - so if I cut it twice - I would get diamonds not squares. My real concern cutting it again is that if those blue sashings don't form straight lines it will look really poor I think. But as I progressed the matching went better maybe it would look OK. I like it with just the one diagonal. I think this way it is truly unique...with regular diamonds, it would be much less so. Besides, the rising lines on a QoV seem rather appropriate, don't you think? Love this! If it were mine project, I wouldn't change it. If you wanted to see what it would look like with other slashes, why not take a pic of the top and print it in color and cut the picture up? That should give you a reasonably close visual of what you could expect. Maybe forego the slashing again and add golden stars randomly appliqued to it. I love it! I would be having a nervous breakdown from cutting it the first time! I'm sure I would be too scared to cut it again, but I'm a fairly new quilter and not confident in my abilities just yet. I would love to see another cut with white to make it pop, but personally, I would never take a rotary cutter to it again if it was mine! I'm pretty sure my luck wouldn't hold out twice, ha ha! I like what you did! When I hated the 1600 quilt that I made I cut it into squares and sashed them, but yours is so much more original. It's gorgeous JUST the way it is, but if you do change it update us as I'd love to see the next version!! According to the gal who coordinates this locally, you can not have golden stars - those indicate death. But I will remember that idea if I ever get sucked into doing one of these again for another cause - lol!! This is a great idea. I love what you have done! I like it just the way it is! Looks great. You certainly could try other cuts, but I don't think they are necessary. I love it!! I do like Jan's idea of adding stars. Great job! RavenLunaStitch - I figured I had nothing to loose. But It is currently hanging over the railing upstairs and I can see it from the living room. It is growing on me just the way it is. Also - the is a size limit to QOVs and I will already have to trim it I think. To everyone else - thanks for your input. It is great to have so many wonderful quilters at the ready for opinions!! Yikes, Eparys, I never knew that about golden stars and have used them in hero quilts. Better look into that before doing it again, huh?!! But continuing reading of this thread has put me in mind of a year long Brown Bag Trade I did once with my Friendship group of 10 members. One of our parameters was that we could cut up the top we received (seriously!!!) and sew it back together. 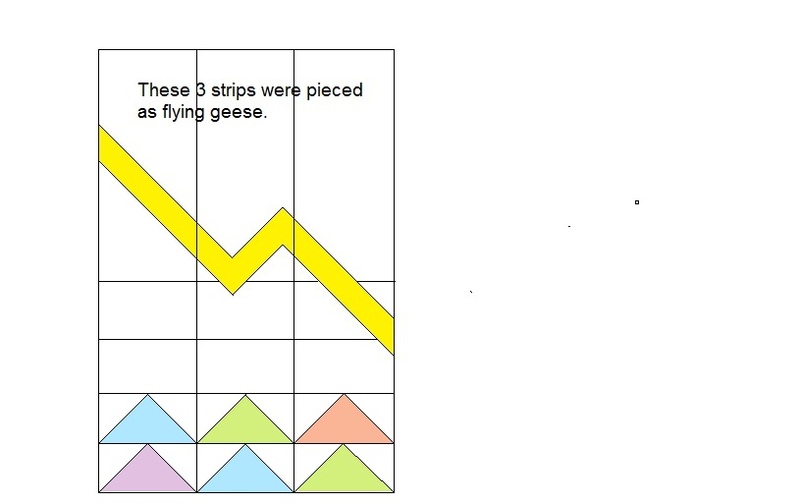 I chose to do this with one quilt of vertical strips of flying geese -- it was a new quilter's piece and she felt if wasn't very well done because the geese in each vertical strip didn't line up with the geese in the adjoining strip. Here is a graphic of how I cut it apart and put it back together. She loved it! What she said! Sounds like a great idea! It looks great just like it is! I do like the way it looks now, but I would be tempted to play. I'd print a draft copy of the picture and see what happens. As in what happens if you cut this quilt into 4 pieces and rotate the pieces before you sew them back again? If you are willing to settle for a smaller quilt, this could result in something even more stunning. Hummm...... Great suggestion and very interesting idea. I will have to think about that! !